I met Les Namingha in the summer of 1989 when my good friend, the renowned Hopi potter Dextra Quotskuyva, explained that she was teaching the art of making pottery to her nephew, Les Namingha, who “showed great promise.” Since then, Les has risen in prominence as a wonderful potter in his own right, receiving many awards including the prestigious “Best of Class for Pottery” at Santa Fe’s Indian Market. Today, there is such a clamor for his work that we are presenting his pottery here as well as at our annual August show at the Eldorado Hotel in Santa Fe. What is most striking about Les Namingha’s pottery is its originality and its diversity. When you ask him to describe his style, he will say that he is an “explorer,” delving into a remarkably wide range of ideas and themes that give rise to his specific pottery groups. 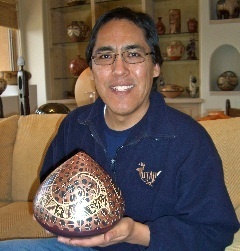 For example, Les will create a series of vessels that explore the iconography and technology of early Zuni pottery (Les Namingha’s family background is both Hopi and Zuni). At another time, Les will create an arrangement of pots in which he uses the surfaces of the vessels as a canvas on which to depict abstract design concepts associated with 20th century Modernism. 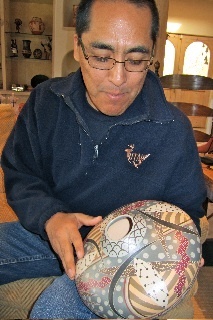 Les Namingha is expert at blending the traditional with th modern - you will often find him painting one of his hand-coiled native clay jars with acrylic paint in the most vibrant of colors - a rarity in Pueblo pottery making, and clearly pushing into new territory. You never see Les Namingha repeating a particular pottery design just because it has become attractive to collectors. Each vessel is absolutely unique, and he is unceasingly seeking new directions in which to take his pottery experimentation. For this, I am ever excited and grateful. Watch our Les Namingha Videos: Les Namingha and his Boomerang jar, Les Namingha and his Sikyatki jar, Les Namingha and his New Migration jar, and Les Namingha with his Summer Solstice jar.